In something of a media blitz around his 35th birthday, Vladimir Kramnik gave another interview, this time to Evgeny Gik of the Moscow-based “Moskovsky Komsomolets”. He talks about Magnus Carlsen’s threat to his chances of reclaiming the title, chess politics and how age has affected his chess. I’ve enjoyed watching the key matches and support, simply on a personal level, Germany. After all I’ve often spent time in Germany and have a lot of friends there. It might be considered my second or third homeland. The team, perhaps, isn’t the strongest at the World Cup, but after they crushed Argentina I believe in them. Moving on to chess. We already know almost all of the title contenders. Who’s the most dangerous for you? Carlsen has clearly improved, and you can’t rule out Topalov with his multiprocessor machine. When everything’s been determined – the tournament format and schedule – then I’ll come up with a final plan for my preparation. 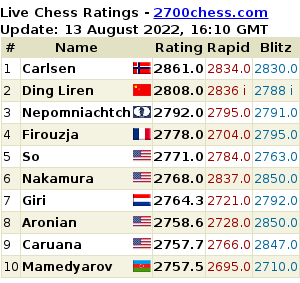 You once said of Magnus Carlsen that there’ll come a time when it’ll be impossible to compete with him. Has it already arrived? The Norwegian’s successes really are impressive, but nevertheless they’ve been achieved mainly against the lower half of the table. So that if we talk about matches against, say, Anand or myself, I’m not sure that Carlsen will be the favourite. But in a tournament his chances are greater – his flexible, malleable style adjusts well to different types of opponents. In that you can see the influence of Kasparov who also, on top of everything else, was capable of “cutting down the tail-enders”. The traditional tournament in Dortmund starts soon. Are you planning to establish yet another record, claiming your tenth victory? I wouldn’t mind, but winning a super tournament on demand is tough, especially if the thought of “number 10” haunts me. It could even get in the way, but I’ll try to concentrate on the chess itself. Ilya’s a prominent businessman, but he’s also well established in the chess world. It’s rare to find someone at a respectable age [he’s only 30!] taking up the game and quickly reaching the level of candidate master. That’s evidence of his outstanding intellectual abilities. Levitov is a skilful organiser, and someone who has on many occasions found sponsors for Russian chess. By the way I was very upset when, out of nowhere, this scandal arose in our federation, causing it to suspend its operation for a number of months. It’s good that everything’s calmed down now and we can prepare for the Olympiad. Our team is, as always, the strongest, but we’ve got serious competitors. We’ll try to occupy the very top spot. A sharp battle has flared up for the Presidency of FIDE between Kirsan Ilyumzhinov and Anatoly Karpov. Who, in your opinion, has the greater chances? What is Gary Kasparov’s role in the confrontation? Kasparov likes to whip up a storm of activity, and if he starts then you can’t stop him. But the union of the two ex-champions is a little strange and, no doubt, ephemeral, as after all they were bitter rivals for a quarter of a century. It’s also strange that until recently Gary publicly supported Ilyumzhinov, while now he’s agitating against him with no less enthusiasm. What can you do – that’s politics and it has its own laws. Again, it’s their business, while all that’s left for me is to play chess, and hopefully well. Vladimir, do you feel like a young man at 35 or do you feel the weight of your years? She’s a year and a half old, and for now she’s more inclined to chew the pieces than to move them. But in a couple of years I hope to acquaint Dasha with chess. My daughter brings great happiness, a lot of positive emotions and an additional incentive to preserve a good mood and cherish life. You don’t have any plans for a son yet? Vladimir, you’re the only Russian with a chance of claiming the chess throne, and all chess fans here believe you’ll return the crown to this country. I just love this site – great work – thank you very much! Wow. Just run across this page today. This is really a great job, Mishanp. Hey nice page and quite unique to what it offers. Was here, and will be back. Thanks also to Mishanp for the referral. Now back to the Tour de France. Thank you for the excellent translation. A pleasure to read. And of course, Vladimir is a class act. OK, this is a great site. Keep up the good work, mishanp. I have a question. Is somebody sponsoring this site or is it just voluntary work?